You can see how it uses its intelligent foot and ankle structures to walk and maintain its balance in the videos below. 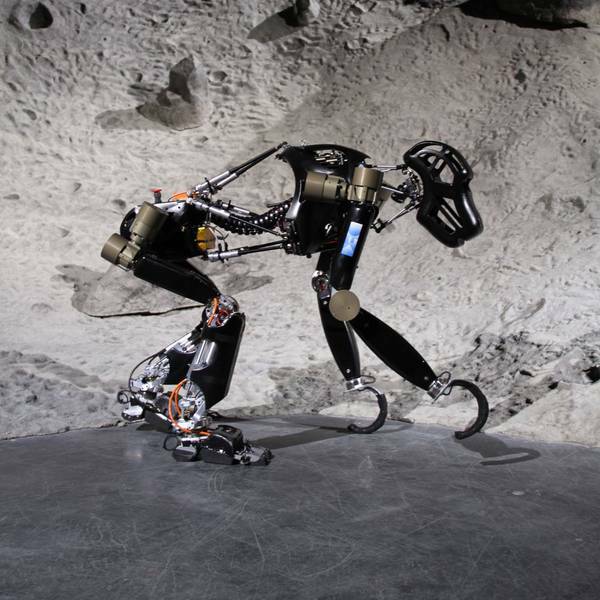 It's a small step for a robot ape, but a potentially giant leap for robot ape kind. If you thought the monkey-like robot AMEE seen in the Val Kilmer sci-fi flick Red Planet was a tad far-fetched, think again. The German Research Center for Artificial Intelligence (DFKI) and the University of Bremen are working on an ape-like robot called the iStruct Demonstrator that it classifies as a "Space Robot." Lately the mechanical monkey has been practicing how to walk and balance in the center's mock lunar landscape. Exploring the hazardous lunar landscape calls for a variety of forms, and researchers at the DFKI are exploring their options (including a combination of legged and wheeled robots). 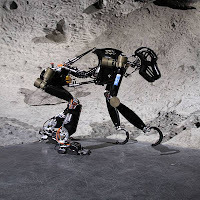 An ape-like body has certain benefits over a wheeled robot; its four-legged stance is stable when scrambling over obstacles or hilly terrain, and it can easily right itself if it falls over. Then when it needs to do something with its hand(s), it could feasibly balance on its hind legs to free them up for manual work. The CHIMP robot currently being developed for the DARPA Robotics Challenge has adopted a similar strategy.